The Best of Canada’s West is an idyllic way to tour the Canadian Rockies. 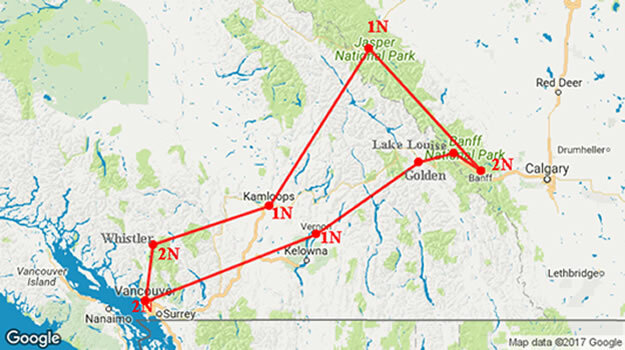 This 10 Day complete round trip tour starting from the Vibrant city of Vancouver takes you to the charming resort of Whistler and onwards to the ranch lands of British Columbia to Kamloops. From here you journey on the Yellow head highway towards the picturesque province of Alberta, where you shall experience Jasper & Banff National parks at their greatest. Travelling through the surreal valleys of Yoho, Glacier and Mt. Revelstoke National Parks and passing by Canada’s Houseboat capital of Sicamous, enter the famous Okanagan region known for its famous Orchards and Winery overlooking the breathtaking Okanagan Lake. • 9 Nights Hotel Accommodations. • Capilano Suspension Bridge, FlyOver Canada, (Vancouver). • Peak2 Peak Gondola (Whistler). 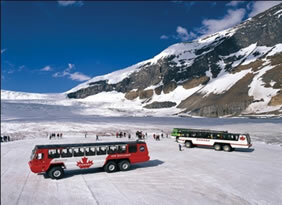 • Ice Explorer Ride on Athabasca Glacier & Glacier Sky Walk – Jasper National Park. • Sulphur Mountain Gondola, Minnewanka Lake Cruise - Banff. • Winery Visit with Wine Tasting - Kelowna. • Farewell dinner at the Top of Grouse Mountain in Vancouver. On this tour, be enthralled as you travel through the Mighty Canadian Rockies recognized for their stunning landscapes, meandering rivers, Glacial Fjords, turquoise lakes, tumbling waterfalls, steep canyon walls, alpine meadows, breathtaking valleys surrounded by millions of Christmas trees. Arrive at Vancouver, check-in at your Hotel. Remainder of the day will be at leisure. Our Tour Manager will meet you at the Hotel Lobby.In the evening a leisurely walk to the Indian restaurant for your Dinner. After breakfast you shall be taken for a sightseeing tour of Vancouver. Visit the Robson Street, the Art District, Sport Venues, China Town, the Old Vancouver where you walk on the cobbled pathway of the famous Gas town and check your time with the clock, Also visit – FLY OVER CANADA – A Breathtaking flight simulation ride where you take off into a huge dome screen with latest projection and flight technology creating a true flying experience wherein you shall spend 8 minutes on an unforgettable flying ride soaring East to West over some most spectacular scenery the country has to offer. There after head for the 1000 acre Stanley Park where you see the Totem Poles at the Brockton Point & get a spectacular view of the ocean at Prospect Point, The English bay, Queen Elizabeth Park, The prestigious Shaughnessy Estates & the Granville Island. Also visit Vancouver’s favorite attraction – The Capilano Suspension Bridge. Feel the thrill as you walk the swaying planks of the suspended bridge breathtakingly suspended 300 feet above the Capilano River. Later travel on the scenic Sea to Sky highway with great views of the Howe Sound, Glacial Fjords and forested valleys before arrival at the Winter Olympic resort of Whistler. In the morning after breakfast proceed for the breathtaking Peak 2 Peak Gondola ride that offers unparalleled views of Whistler and Blackcomb Mountains. Rest of the day is at leisure to enjoy the numerous activities Whistler has to offer. Some of them are like Bungee Jumping, Zip lining, Rafting, Tree Adventures, 4 x 4 ATV Tours. Departing Whistler this morning, marvel as we travel on the scenic Duffy lake road passing by the hamlets of Pemberton and Lillooet to arrive in the Ranchlands and Cowboy country side of Kamloops. Today morning we leave for Jasper. Travelling along the North Thompson River and on the Yellowhead Highway, we pass by Clearwater, Blue River, Valemount & crossing the highest peak in the Canadian Rockies – Mount Robson, we enter Jasper National Park. One of the largest national parks in the Canadian Rockies with 10,878 square kilometers of mountain wilderness. Upon arrival we proceed for an orientation tour of Jasper. Travelling on the Maligne Lake Road, we explore the natural attractions of Maligne Canyon, where one can stroll along the 50 meters walls while learning about its unique underground water system, the remarkable & disappearing Medicine Lake and frequently photographed Maligne Lake. We travel on North America’s most beautiful road - The Ice Fields Parkway. Shortly after departing Jasper you shall be arriving at the Athabasca Falls. The falls are known for their interesting erosion pattern occurred over the millennia as they cut the rock bed into a gorge below. Feel the spray of the Athabasca river water as you walk on the Walkways and the bridges. The next stop will be at the Ice Fields Centre where we shall experience a ride on the one of a kind All Terrain Ice Explorer over the Athabasca Glacier which is 6 sq. Km in area, 270-1000 feet deep as the size of the Eiffel tower. 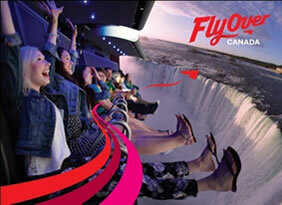 Later we visit the Rockies latest attractions – The Glacier Sky walk. A cliff edge walkway extending along the Sunwapta Valley below where the glass separates you from the 918 feet drop. Later we head for Banff with enroute view points like the Peyto Lake (Seasonal), Crowfoot Glacier. your today’s tour is the Banff Lake Cruise. Here you shall view Rocky Mountains in a new perspective while cruising the beautiful Lake Minnewanka on a 90 mins interpretative cruise. Take in breathtaking mountains and emerald-green water as you keep a watchful eye on forested slopes and rocky shorelines for wildlife and waterfalls. Today we continue our journey to the Jewel of the Canadian Rockies – The majestic Lake Louise. The historic Chateau style hotel with its beautiful lake and the majestic Victoria glacier in the backdrop is one of the most photographed places on earth. We board our coach today to follow a route chartered by the railroad engineers and fur traders of the mid 1800's. Kicking Horse Pass leads us from the Rockies into the Columbia River Valley before we climb through Rogers Pass in Glacier National Park. The Selkirk Mountains receive massive amounts of winter snow and are home to over one hundred active avalanche zones. We pass the Monashee Mountain range and travel south into the fertile rich Okanagan Valley to arrive at the resort town of Vernon. In the Morning after breakfast, visit to a local winery for a tasting tour. After lunch proceed to Vancouver. Travel through the Okanagan Highway, enjoy the Scenic drive through the Abbotsford located in the Fraser valley. Upon arrival Vancouver in the evening proceed to Grouse Mountain located north of Vancouver. Your Alpine experience starts as you take the Grouse Mountain Tramway and soar above towering Douglas firs, with breathtaking views of the City of Vancouver, The Gulf Islands and the Sparkling Pacific Ocean. Enjoy the Last leg of your journey with a Farewell Dinner at the highest peak of Vancouver – Grouse Mountain. Our tour ends today after breakfast as you check out of your hotel. • 9Nights Accommodation at moderate 3*hotels. • Daily Breakfast at Hotels. • Daily Lunch’s (except Lunch on day 1 of your arrival). • Farwell Dinner at Grouse Mountain. • Transportation and Sightseeing Tours by Private AC Coach as per the itinerary. » Capilano Suspension Bridge – Vancouver . » Flyover Canada - Vancouver. » Peak2 Peak Gondola Whistler. » Ice Explorer Ride on Athabasca Glacier - Jasper National Park. » Glacier Sky Walk – Jasper National Park. » Sulphur Mountain Gondola - Banff. » Lake Minnewanka Cruise - Banff. 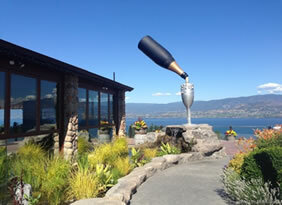 » Winery Visit with Wine Tasting - Kelowna. » Grouse Mountain Sky Ride – Vancouver. » Services of your Tour Manager. » Baggage Handling of 1 Piece per person. » Personal Expenses like usage of Laundry, Bar, Services from the Hotels or any service not mentioned in the above inclusions. » Hotel Check-in Time is 4PM. Check out time is 11.00AM. » Room type/Bedding is 2 Queen Beds. Any additional request is subject to availability and will be at an additional cost. » Smoking is not permitted in the Hotel / Room and the Coach. 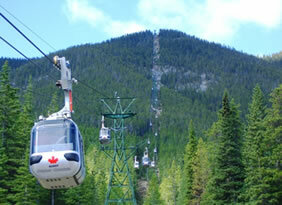 » Peak 2 Peak Gondola in Whistler will not be operating for May 18 departure. The same will be replaced by Sea to Sky Gondola in Squamish. » Lunch in the afternoon will normally be light and will consist of 1-2 dishes or Packed lunch. Dinner will be based on full buffet style. Guest will have to walk to the restaurant which will be an approx 10min walk from the Hotel. » We reserve the right to alter/re-schedule /amend /cancel the tour /itinerary /due to unforeseen circumstances /weather conditions or anything that might arise beyond our control.